Here’s a common question that Catholics get from our Protestant brothers and sisters in Christ: Why do Catholics baptize infants? First off, let’s go over briefly why baptism is important. Jesus was baptized by St. John the Baptist in a baptism of repentance, but after Pentecost and the descent of the Holy Spirit on the Church, baptism wasn’t just symbolic but salvific, according to Jesus himself in Mark 16:16: “He who believes and is baptized will be saved”. St. Peter clarifies this even more in 1 Peter 3:21: “Baptism, which corresponds to this, now saves you, not as a removal of dirt from the body but as an appeal to God for a clear conscience, through the resurrection of Jesus Christ”. So we can see that baptism is actually necessary for salvation (yea there’s exceptions thanks to God’s mercy for people who haven’t ever heard the Gospel and stuff). We can see from this story that it is important to be baptized as soon as possible, and the joy that it gave them both. Now, it’s safe to say that most Christians are in agreement about everything that I’ve said so far. The tricky part is the question of what age is a good age to be baptized. Catholics baptize infants, and some Protestants have issues with that because they really haven’t made a choice for themselves. I can see their point. But we have to remember that Baptism is a sacrament that gives grace, no matter what choice you had in it. Let’s look at examples of what the apostles said and did in terms of baptism. In his first big speech, St. Peter told all the people of Jerusalem, “Repent, and be baptized every one of you in the name of Jesus Christ for the forgiveness of your sins; and you shall receive the gift the Holy Spirit. For the promise is to you and to y our children and to all that are far off, every one whom the Lord our God calls to him” in Acts 2:38-39. There were no clauses in what he or Jesus said that designated only adults. St. Paul baptized Lydia and her entire household (children included probably) in Acts 16:15 after they converted. A similar thing happened with the jailer and his whole family in Acts 16:33. 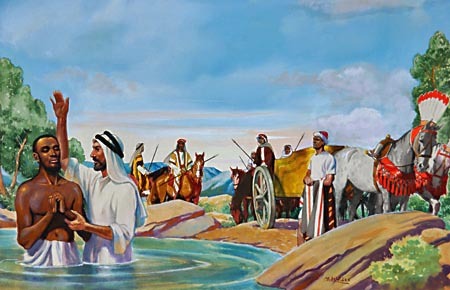 St. Paul wrote in 1 Cor 1:16 that he baptized the entire household of Steph’anas.